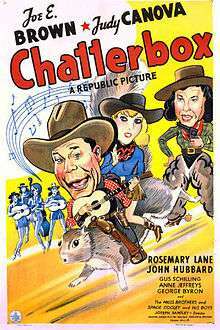 Chatterbox is a 1943 American comedy film directed by Joseph Santley and written by Frank Gill Jr. and George Carleton Brown. The film stars Joe E. Brown, Judy Canova, Rosemary Lane, John Hubbard, Gus Schilling and Chester Clute. The film was released on April 27, 1943, by Republic Pictures. ↑ "Chatterbox (1943) - Overview". TCM.com. Retrieved 2015-11-08. ↑ L.B.F. (1943-07-02). "Movie Review - Chatterbox - At the Palace". NYTimes.com. Retrieved 2015-11-08. ↑ "Chatterbox". Afi.com. Retrieved 2015-11-08.